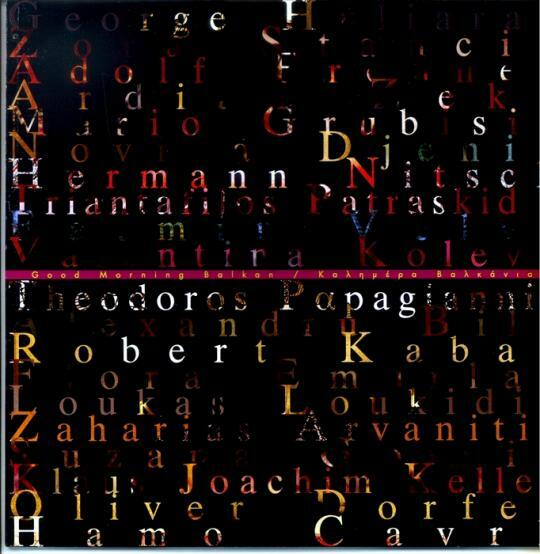 02. june 2003 exhibition catalogue in 40 pages, 22x22 cm in colour, published in athens with texts in englisch and greece by george papandreou, benita ferrero waldner, dora bakoyannis, ioanis pattelis, fate velaj and carla manolopolou. south-eastern europe is not only a region which determines the quality and the future of the european policy, but it is also an area of a creative art beginning. the upcoming team exhibition, which joins work of art from several artists from greece, croatia, slovenia, bosnia, serbia and montenegro, kosovo, albania, bulgaria, romania, austria and germany, has been organized by the international network forum weltoffenthis foundation declares the democratic cooperation among different national and cultural teams and through the cultural events it is addressed to the public in order to conduct open and critical dialogues about the deepening of the understanding between people. the cooperation of diversified artistic and intellectual aspect creates cohabitation models (best practice model) for a society which is orientated in a pluralism way.the title of the exhibition is good morning balkan. the term balkan has a positive meaning, verifying the spirit of cooperation among the artists, whereas good morning balkan may symbolize the beginning of the coexistence of different national groups and cultures without any opposition.these groups have old traditions and their memories have remained attached do the morals of their history, as it was tragically revealed during the last decade of the 20th century. for this reason i send my greetings to al the art initiatives which exceed the traditional dialogues and discussions about legality.i wish to thank the cultural centre of athens and the organizers of the eco festival for their attempt to present the art exhibitions good morning balkan in this significant period of time of the european completion. the fact that such events can be organized in this place where civilisation was born proves one more time that europe knows how to take advantage of its cultural wealth acquired through years. with great pleasure i send my greetings to the organisers of the art exhibitions good morning balkan the greek government and the greek national tourism organisation pay special attention to the development of a closer cooperation among the countries in south east europe. our goals is the presentation of the common cultural and historical bonds and the creation of common tourist programmes that promote our civilization as well as the creation of cultural travelogues. good morning balkan event happens appropriate period of time so as to support this attempt and underline our cooperation on cultural issues. greece, a member of eu now in the presidency, has taken several initiatives for the second semester of 2003 to promote the cooperation among the regional countries. these activities are of great importance since most countries are under accession in the eu or nominated to enter , therefore, events such as good morning balkan are extremely helpful for the people to come closer and to get more acquainted.i would like to wish the very best and congratulate you on your initiative. the art exhibition good morning balkan carried out within the activities of the 5th eco festival and in cooperation with forum weltoffen in austria, constitutes a very significant initiative for the promotion of civilisation and an opportunity to broaden our cultural exchanges. we wish to thank deeply all the artists which come from different societies and express their cultural restlessness and searches through their works of art. we hope that will always carry inside this creative inspiration. balkan is one of the most ancient regions in the world with thousands years of history and culture. this culture was transferred and became a point of reference for many different civilisations. the art exhibitions good morning balkan organised by forum weltoffen in austria and presented in the 5th eco festival in athens, is a special opportunity for the nations to show their cultures and civilization. artists from many different countries of the balkan and from austria will meet in a special room, where they will illustrate-using colours and shapes-their worries, their problems, their religions, their environments, their desires, their dreams, their hopes, their daily life, their talent. they will share their experiences and values of culture and in addition they will wish to each other a good morning .forum weltoffen, one of the most successful organisations of interculture, has organised many cultural activities in different countries around the world and proved in many occasions that the power of art and artists may bring people together with a love message, therefore the world may look better. i would like to thank all the artists which took part in this activity as well as the organisers in austria and greece whose support was extremely valuable. i am grateful to the 5the eco festival in athens and i would like to thank them because they realize the power and the character of this activity and offered their help and their collaboration on this successful event. i wish in the future to establish a closer cooperation with eco festival for the best of the international art and culture and the cultural exchange between austria and greece. clean up greece present the art exhibition good morning balkan with the framework of the 5the eco festival (environments with culture) in cooperation with forum weltoffen- international network for cultural exchange. the aim of the exhibition is the deepening and the exchange of knowledge and practices in regards to cultural pluralism in diversified societies, with the participation of persons from varied cultural backgrounds. the history of mankind has proved that the environment exerts a positive influence on the development of the human personality and on the spiritual civilization. this attempt to join together artists from different regions in balkan, signals the beginning of a new era during which new roads are opened for the harmonic coexistence and interaction of different civilizations. the eco festivals and the forum weltoffen believe that working with art and culture will help the process of peace in our time. we wish to thank all the participants, the supports and the forum weltoffen for the creative cooperation. i will be a pleasure for us to establish a steady cooperation with the forum weltoffen in the future, in order to extend our common efforts regarding cultural issues.